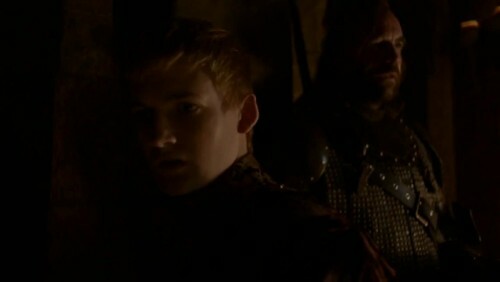 And our last new scene, this time with Joffrey and the Hound… and we’re not sure what’s going on. This doesn’t seem to be a scene from the novels. At a guess, it relates to wildfire… or perhaps to the idea that Joffrey will be set up with a girl from one of the brothels, perhaps, to try and sweeten him a bit.